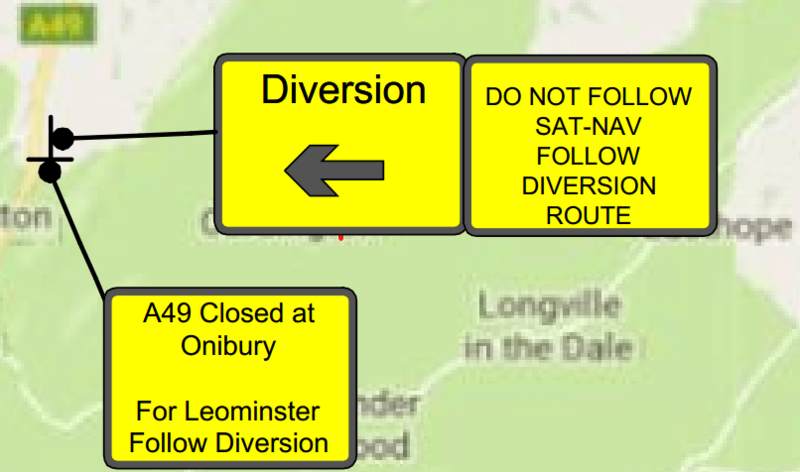 The A49 is shut at Onibury north of Ludlow until the early hours of 10 July but you can still get to Ludlow easily. Our town is open for business and visitors as usual. If you are coming to Ludlow from the Shrewsbury direction, take a left onto the B4368 in the middle of Craven Arms. That’s the roundabout outside Harry Tuffins. After 6km (3.7 miles), turn right onto the B4365. That takes you through the village of Culmington and across Ludlow Racecourse before returning the A49. Please take care on this route. Its suitable for cars and for coaches. But it’s not a route for heavy trucks. Culmington is a rural village and an innocent victim of this unprecedented closure. A temporary 30mph limit is in place through the village. Coaches and cars can take the alternative route using the B4368 and B4365. Signs along the A49 from Shrewsbury to Craven Arms will shout out that drivers should turn around and go back to Bayston Hill. These signs are advisory. They will scream “Do not follow Sat-Nav. Follow diversion route.” But the road is still open as far as Craven Arms and the route via the B4368 and B4365 is suitable for cars and coaches. A 30 mile an hour speed restriction is in place through Culmington. People driving south from Shrewsbury will meet at barrage of signs at the Bayston Hill (Dobbies) roundabout on the A5. The official diversion is a 60 mile route. If you follow the diversion signs from Craven Arms, they will take you on a 93 mile route instead of the usual 10 miles. The BBC suggests this might be the UK’s longest diversion. The diversion takes traffic from the Dobbies roundabout along the A5 to join the A458 to Much Wenlock – a small town that will suffer rather than benefit from the increased traffic. From Wenlock, traffic will continue along the A458 to Bridgnorth, where planned roadworks on the bypass have been reduced for the period of the A49 closure. Traffic will be directed onto the A442 to Kidderminster, which is never the best place for free-flowing traffic. Finally, vehicles will climb Bewdley Hill before twisting their way along the A456 via Tenbury to Woofferton, four miles south of Ludlow. Map of diversion signs. Map of diversion signs (insets). Traffic from Hereford will be diverted onto the A456 towards Kidderminster at Woofferton. But signage here will say, “Access as usual for Ludlow”. So just drive north to Ludlow as usual. 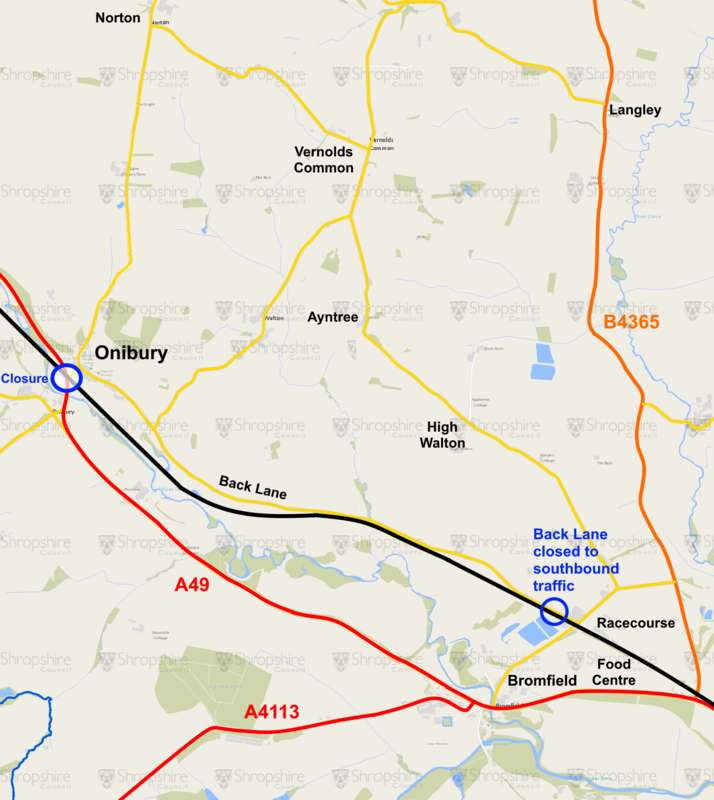 The rail line between Shrewsbury and Hereford will be closed this weekend, 1-2 July, and next weekend, 8-9 July. An hourly replacement bus service will operate (presumably via the Culmington diversion). It will depart from the station car park in Ludlow. Please check times before travelling. The 435 Ludlow to Shrewsbury bus service, run by Minsterley Motors, will run its usual timetable, diverting via Culmington. There is a danger of Back Lane from Ludlow Racecourse to Onibury becoming a rat run around the A49 closure. This is a narrow lane with few passing places. A one-way system allowing only northbound traffic is in place north of the racecourse. This restriction will be kept under review during the roadworks. More details of local restrictions. We tried to go that way today going north but signs said road closed at Culmington! Is it true or are they just trying to put people off? Coming south we turned off at Onibury and came down the little road to the east of the railway. Lots of cars doing that but very narrow.